The party favors might be gone (in just under an hour all 100 notepads were spoken for!) but I’ve still got plenty of delicious goodies to share. 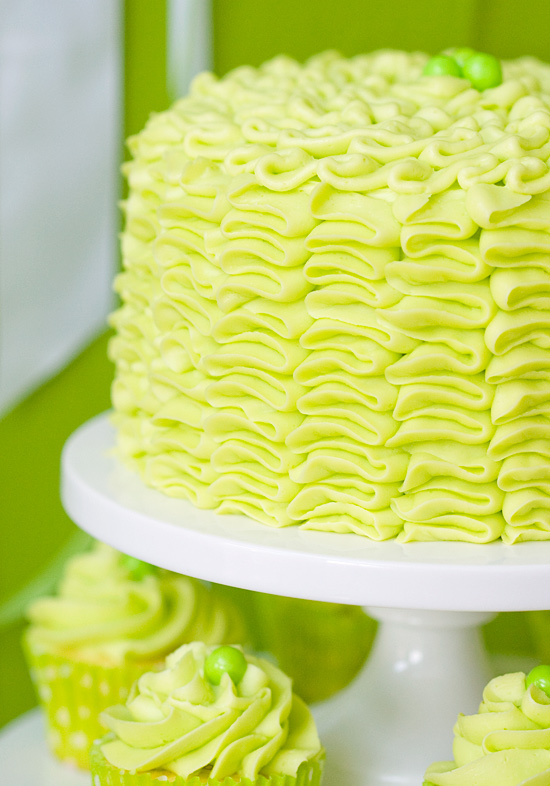 The centerpiece of our little party was this ruffled green layer cake and matching cupcakes. 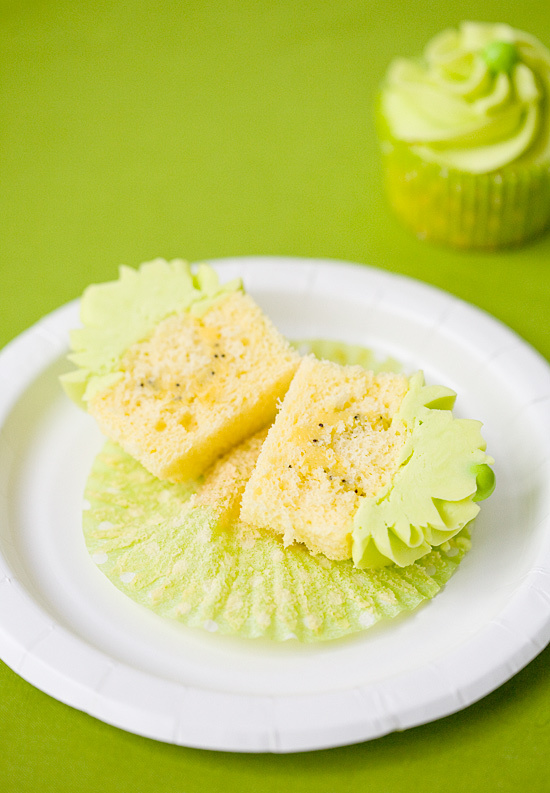 Light and airy lemon chiffon, filled with a rich and delicious lemon poppyseed curd, and frosted with a lemon curd-spiked buttercream, dyed a lovely shade of lime green. The ruffles really aren’t as hard as they look. Just ask Martha. Although a solid 20 minutes of squeezing left my right hand a little shaky. The result was worth it, though. Is it just me or does it look awfully dinosaur-esque when cut? For the cake itself, I adapted a Lemon Chiffon Cake recipe from my favorite cake book, adding olive oil and using meyer lemon instead of regular lemon. I was completely paranoid of ending up with an oozy filling, so I opted to add a bit of gelatin to the curd to help it firm up. That, paired with a dash of poppy seeds, made for an incredible filling. Even for non lemon lovers like me (and you know my preferred cake includes chocolate, chocolate, and more chocolate, so that’s saying a lot). 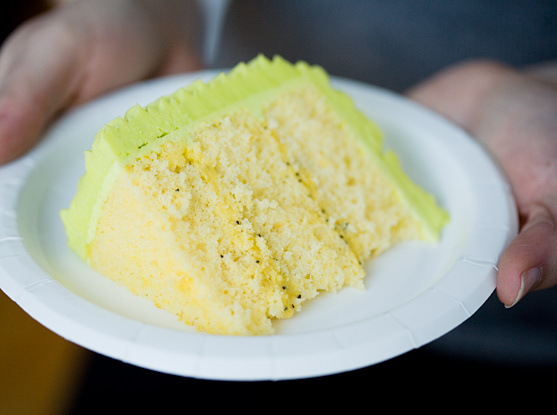 The chiffon cake is much lighter than your typical butter cake, due to the egg white and oil base. You can’t actually taste the olive oil, however, except for maybe a slight underlying fruitiness that compliments the lemon quite nicely. Simply halve this recipe for a 6-inch layer cake, or a more reasonable 30 cupcakes. Preheat the oven to 350 degrees F. Line the bottoms of three 9-inch-round cake pans with parchment paper. In a bowl, whisk together the egg yolks, olive oil, lemon juice, lemon zest, and water. In the bowl of an electric mixer, whip the egg whites with the cream of tartar on medium speed until light and frothy. Slowly add 1/4 cup of sugar and continue to beat until soft peaks form. Sift the flour, remaining sugar, baking soda, and salt into a large bowl. Whisk gently to combine. Make a well in the center of the dry ingredients. Pour in the egg yolk mixture and mix to create a smooth paste. Add one-fourth of the egg whites and fold in to lighten the batter. Fold in the remaining egg whites until evenly incorporated. Divide among perpared pans. Bake for about 15 minutes or until a cake tester inserted near the center comes out clean. Transfer to wire racks. Once cool, run a knife around the cakes to release, then invert onto wire racks. Cakes should come out cleanly. At this point the cake layers can be frozen, wrapped in a double layer of plastic wrap and bagged, for up to a month. Freezing the cakes also makes them easier to work with later. To prepare curd, place 1 tablespoon of the lemon juice in a small bowl. Sprinkle gelatin over top. Let sit at least 5 minutes or until evenly moistened. Whisk together the whole eggs, yolks, sugar, remaining 1/3 cup lemon juice, and lemon zest together in a medium heat-proof bowl. Place bowl over a pot of gently simmering water. Cook, whisking constantly, until the curd thickens enough to coat the back of a spoon (it should reach approximately 165ºF), about 5 to 7 minutes. Do not let it boil. Whisk in gelatin mixture and cook for one minute more. Strain the mixture through a fine mesh sieve. Stir in the butter until melted and smooth. Cover with plastic wrap, pressing the wrap onto the surface of the curd. This will prevent a skin from forming on the top of the curd. Refrigerate until set and thoroughly chilled, at least 3 hours. To prepare frosting, in the bowl of a stand mixer fitted with the paddle attachment, beat butter on medium speed until very pale and creamy, about 8 minutes. Add powdered sugar, a little at a time, mixing well after each addition. Add 1/4 cup of curd and mix until smooth. Add cream, a little at a time as needed, and beat until light and fluffy. Mix in food coloring, if desired. Add more cream or powdered sugar as needed to acheive desired consistency. Stir poppyseeds in to remaining curd. To assemble, level each cake layer by cutting of the domed top with a long serrated knife. Place one layer, flat side down, on a cake stand or serving platter. Spread 1/4 cup of curd evenly on top. Position second layer on top and press to adhere. Repeat with another 1/4 cup of curd, and final cake layer, flat side up. Since the curd is slippery, it may help at this point to insert a dowel in the center of the cake to keep things in place. 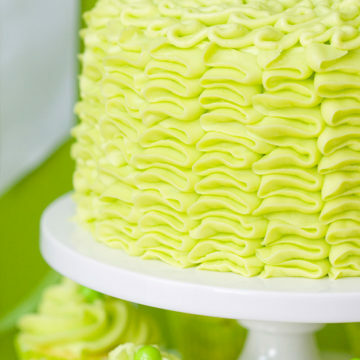 Cover the entire cake with a thin layer of buttercream. This “crumb coat” will make frosting the cake easier. Refrigerate for about 15 minutes to allow this crumb coat to set. 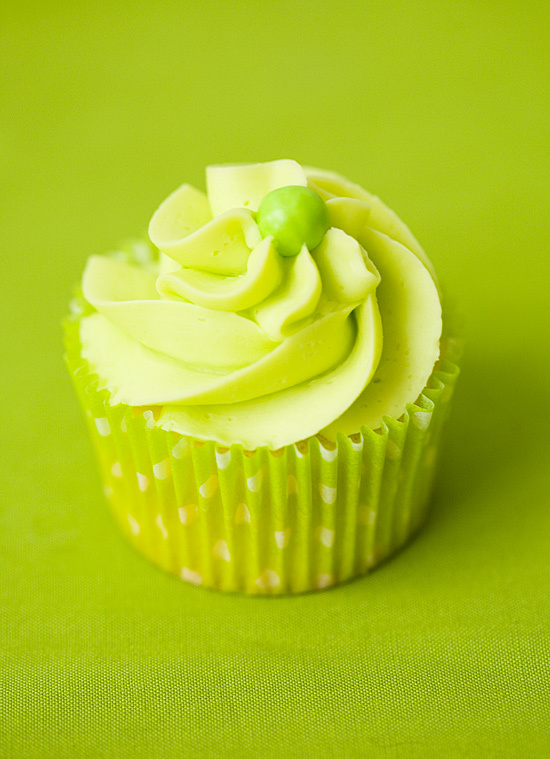 Remove cake from refrigerator and frost with remaining buttercream. *To use this recipe for cupcakes, fill cupcake liners 2/3 full with batter and bake for 12-14 minutes, or until a toothpick comes out clean. Allow to cool completely. Using a small pairing knife, cut out a cone shaped piece from the top of each cupcake, approximately 1-inch in diameter, and set aside. Place approximately 1 teaspoon of filling into each hole, then replace tops. Press to adhere. Frost with buttercream, taking care to cover the seams. Adapted from Sky High Cakes.